Congratulations to Eden Park Elementary School for winning the 95210 Kids on the Go! Golden Sneaker Award. 25 students from Eden Park accumulated the following: 7,917,785 steps, 1,499.58 miles, and 429 food packages during the month of November. 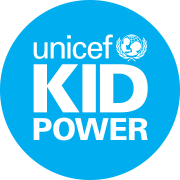 When the 25 students were asked to use the UNICEF Kid Power and realized that every step they would take will turn into lifesaving food packets for malnourished children around the world they took it to heart. They set their minds to exceed the daily average of 12,000 steps each, and they did just that. The team average 14,000 steps a day. They continued to shock their teachers with their continued dedication and commitment to feed as many malnourished kids around the world that they could. The first goal was 100, they met it, they set the next goal at 200, they met that one too. On and on it went until the final day, when they worked hard to make sure they would get over 400 packets. Sure enough they did, they finished with a total of 409 packets of food donated. We could not be more proud of them and their dedication to help to stop hunger. Special thanks to the University of Florida/IFAS Collier County Extension for purchasing the bands, setting them up and continued support to this program. ← 2017 Fall 9521 Kids on the Go!